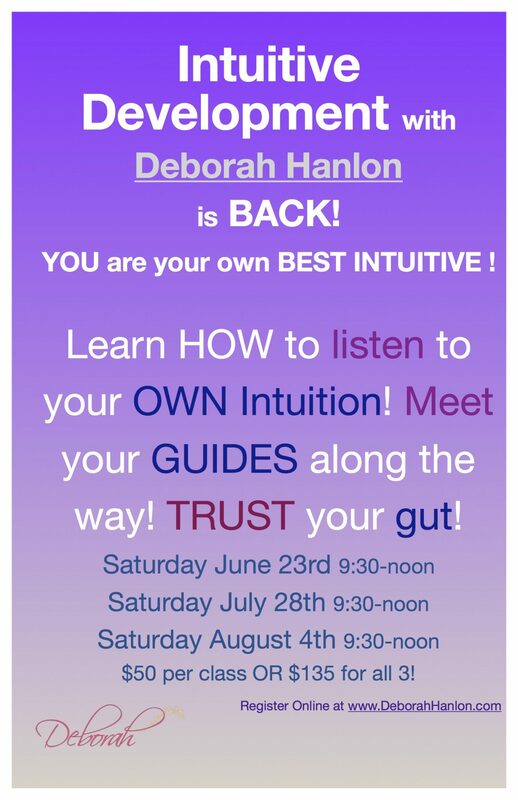 Intuitive Development Workshop with Deborah Hanlon / Identify (and Upgrade) your Personal Vibration!!!! Identify (and Upgrade) your Personal Vibration!!!! Vibration dictates your Experience! When we are ‘vibing’ low thoughts, we ATTRACT lower, heavier experiences. When we raise our vibrations up even just a teeny bit, major Life Transformation begins!!! This is the FIRST Time I’ve ever taught this as a separate class and it’s going be Out of this World!!! Learn how to RAISE your Vibration to help YOU attract a Better Experience!! Understand WHY certain things are NOT coming into your life! Once we understand our Vibrational pattern and identify when we are ‘low’ versus ‘high’, you can EASILY switch up your experience of your current life!! A MUST take class! The workshop is $50.00 to attend, if you pay in advance. Walk ins are welcome, $60.00 cash at the door. Any questions, please email Michelle at info@beingknowingdoing.com!